An must see destination in any cultural tour of South India, Halebid also known as Halebeedu, was the capital of the powerful south Indian dynasty of the Hoysalas who were famous temple builders. Halebid, previously known as Dwarasamudra (the gateway to the sea), is home to the awe-inspiring to the Hoysaleswara temple. 17 km away is another splendid attraction of Belur, which became the Hoysala capital after Halebid. Belur is famous for the Chennakesava Temple, one of the finest specimens of Hoysala architecture. While visiting Halebid and Belur don’t miss Sravanabelagola, famous for its colossal statue of the Jaina monk Gomateswara. 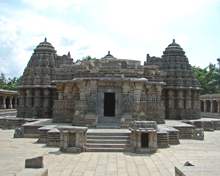 Halebid’s claim to fame, Hoysaleswara Temple, is a masterpiece of Hoysala architecture. The building of the temple commenced in 1121 A.D and went on for more than 190 years. Its construction was initiated by Ketmalla, a general of Hoysala ruler Vishnuvardhan who ruled for a long period from 1108AD–1152AD. Perched on a star shape base, the walls of the Hoysaleswara Temple are richly sculpted with several varieties of carvings and friezes. Within the premises of the Hoysaleswara Temple is located a sculpture gallery maintained by the Archaeological Survey of India. Smaller than Hoysaleswara Temple, Kedareswara Temple was built by Ballala II and his queen Abhinava Ketala Devi in 1219 A.D.
located in a tranquil surroundings, the shrine features three superstructures and finely carved sculptures. 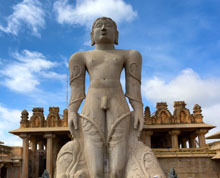 500m away from the Kedareswara Temple, the three Jain temples have fine carvings. The presence of these temples displays the secular nature of the Hoysala rulers. 17 kms from Halebidu is located Belur which is known for the awe-inspiring Hoysalan Chennakesava Temple. Situtaed on the banks of the river Yagachi in Hassan district, Belur was the centre of power of the Hoysala before Halebidu. Veernarayan Temple and Kappe Chennigaraya Temple are other famous important monuments in Belur. Located in the Hassan district, Sravanabelagola is a famous pilgrimage site of Jainism. 48 km from the Hassan city, Sravanabelagola is renowned for its imposing statue of Gomateswara, also referred to as Lord Bahubali. Carved out of monolithic stone, the awesome 17 metre high statue was commissioned in 981 A.D and can be seen from a distance of 20km. The next Mahamastakabhisheka ceremony, which involves bathing of the statue of Lord Gomateswara with bucketfuls of milk and honey, will be held in 2018. The ceremony is held here every 12 years. 31 km away from Halebid, Hassan is noted for some important shrines like Nageshvara-Chennakeshava, Hasanamba Temple and Bucesvara Temple. Hoysala Mahotsava, the dance festival held at Belur and Halebid is a magnificent event. By Air: 170 km away, Mangalore is the nearest airport connected by flights to different cities in India. By Rail: The nearest railhead is Banavar, 24 km away from Halebid. Banavar is connected to Arsikere, Bangalore and Hubli. Hassan, 31 km away from Halebid, is connected to Arsikere and Bangalore. By Road: Halebid is connected by good motorable roads to all the important places and cities in South India. Some of the ciites and places connected with Halebid by raod are Belur (17 km), Hassan (32 km), Arsikere (45 km), Srirangapatna (133 km), Mysore (149 km), Mangalore (170 km), Bangalore (216 km). Bus Service: The Karnataka State Road Transport Corporation (KSRTC) operates regular bus services from Belur and Hassan to Halebid. Hassan is connected by KSRTC bus services to other places of importance in Karnataka. There are number of government-run hotels in both Halebid. Located amidst a garden, Hotel Mayura Shanthala is a fine accommodation option.